This was the first week of my ultra taper. While it was a step back from last week’s nearly 60-mile running extravaganza, it didn’t feel like much of a taper. I’m finding it hard to believe running over 40 miles in a week is tapering. I also did the last of my pre-ultra races – Rocky Ridge. A trail half marathon that somehow manages to pack in nearly 4000 feet of climbing in just over 13 miles. Rest and my usual morning stretching. After my slightly insane weekend of running, physically I’m (surprisingly) fine, but mentally, I’m worn down. Today’s run was 100% on autopilot. I couldn’t tell you a single thing I did, saw or thought for the entire run. Not ideal, but I muddled through. My area of focus this week was mindset – I said I can’t keep dreading and dawdling on my way out the door. Using that as a measure, I’m not sure if I can consider today a success or not. I woke up not wanting to run (a step up from dreading the run), and while I did dawdle a bit on the way out the door, it was much less than the last few weeks. Went back over to Lake Temescal. I was hoping for another river otter sighting. No joy on the river otter front, but it was a beautiful fall day for a run. So much better than the heat wave they had forecasted. Todays run was entirely on auto-pilot. I couldn't tell you a single thing i saw, thought, or did. I think i needed to work on my mindfulness. I’ll once again choose auto-pilot to actively dreading a run, so another semi/sorta victory on the mindset front. Did some foam rolling in the afternoon, just cuz. Rest today- maybe too much rest. I got so focused on the stuff I was working on, by the time mid-afternoon rolled around, I’d walked less than 1000 steps. All the running in the world won’t make up for that level of inactivity. This is a killer half marathon. The official measurements of the course have it clocking in at 13.7 miles and climbing 3900 feet. My Garmin varied on both counts, but by any measure, it is super-tough. Rocky Ridge is another ‘run’ that was more walking than running, which I knew going in would happen. I haven’t done Rocky Ridge since 2012, but you only need to do this course once and it will forever be seared into your brain. Like so many runs this summer, I felt equally strong throughout the race (LOVE this trend!). My power-walking stayed strong and I ran whenever I could, even as we got into miles 11 and 12. The little first aid kit and the kleenex I carry in my pack got a workout too as I came across not one, but two different runners who had recently fallen. Some runners may mock my carrying those few extra ounces on runs, but when I came across bleeding runners, I was the one with the goods to help (both were fine – if a little bloody and ego-bruised – and started walking soon after I arrived). Similarly to Drag-n-Fly, the ups and downs were not only plentiful, but also super steep. It’s easy to see why people were falling. Yet another run where I really didn’t want to run. But for a change, it wasn’t entirely mental. I was more sore from Rocky Ridge than I have been after many of my races (not bad or injured achy, just your usual, run of the mill, I-ran-one-of-the-toughest-halves-around achy). Not helping was my timing was a little off yesterday. I had a thing with my running club in the afternoon, so I didn’t do my usual post-race foam rolling. My body noticed and let me know it wasn’t happy. I eventually got out the door. I felt off in the first half mile or so, but I got into the rhythm of it eventually. 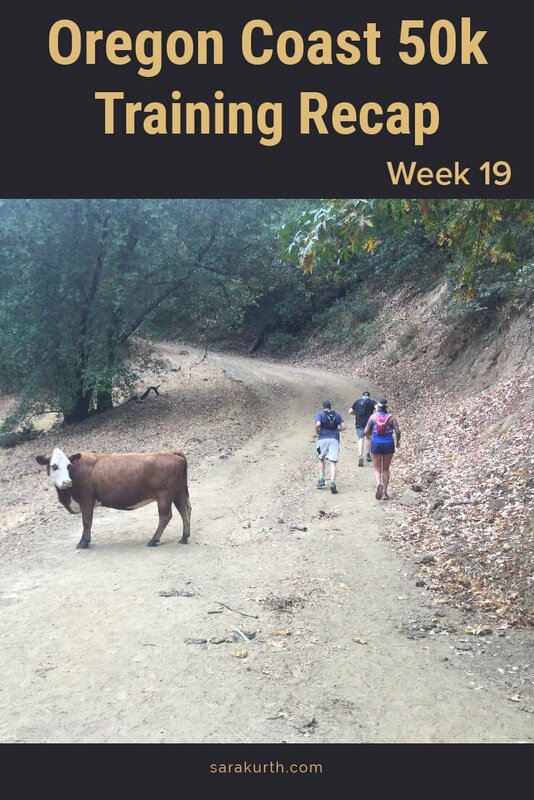 This week felt more like my standard step-back week than the start of a taper. I’m sure that will change this week – I’m ‘only’ running 30 miles!? That’s downright civilized. My stated goal is a run with ‘significant’ elevation gain. Yup. I think I checked that one off. Strength work? Again, a fail. I just can’t get into that habit. Not foam rolling on Saturday made such a huge (negative) difference on Sunday. I didn’t need a reminder of how important foam rolling is, but I got one anyway.